Why are we Rheumatologists looking forward to Tofacitinib (Xeljanz) ? Rheumatoid disease is a chronic disease predominantly involving the joints. We have come a long way as far as treatment & outcomes are concerned. We have been able to put life back into patient’s life. However, not everyone is that lucky. We are still not able to achieve remission in each & every patient. Statistically, almost 20- 30% rheumatoid patients do not improve sufficiently with DMARDs & biologics. The retention rate of most biologics are low (retention rate is the proportion of patients continuing biologics on a long term basis). We have still not understood the rheumatoid pathogenesis completely. We have not yet located the master switch that can turn off the inflammation. As Rheumatologists, we would like each & every patient to achieve remission & do well. That is precisely the reason why we are looking forward to further development in understanding of RA & new drugs to tame the inflammation. In rheumatoid disease, immune cells in the synovium of the joints get activated. They secrete various chemicals called cytokines. These cytokines are absorbed in blood & circulate throughout the body. These in turn act on other immune cells; activate them. The activated immune cells start secreting more cytokines. Theses cytokines are responsible for the joint damage & other complications of Rheumatoid disease. So, our efforts are directed to block either these cytokines or the cells secreting them. This would not only reduce the chances of joint damage but also keep the inflammation in check by blocking activation of immune cells. We can block these cytokines & cells with DMARDs & biologics. Let us consider an example to understand the rheumatoid inflammation & the mechanism of various medications. This is akin to the following plot. If a Rheumatologist is the police; using DMARDs is like using multiple contacts in various airlines asking them to block the entry to the terrorists. This may work if one has good contacts, but is not foolproof. Biologics are more specific. They are like specific legal orders to specific airlines to block their entry. 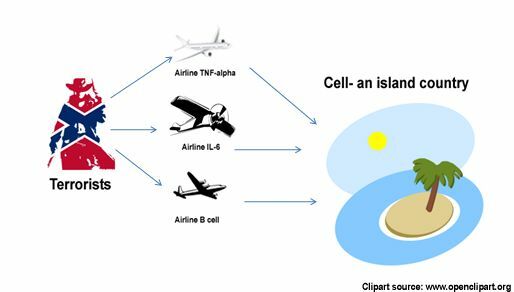 So if one blocks the TNF α Airline from carrying the terrorists, the island is safer. But then, this is not the only airline available. They can always take the other airlines & still manage to enter the country & succeed with their plans. The same way, a biologic works but then is not the final answer. How about going a step further? One can also block their entry at the ports of entry. This will block the terrorists irrespective of the airline they use. This is exactly where we are today. We have taken the war against Rheumatoid to the ‘ port of entry- signal transduction’ level. Instead of blocking multiple different cytokines, we are now looking at blocking the cellular system that responds to multiple cytokines. 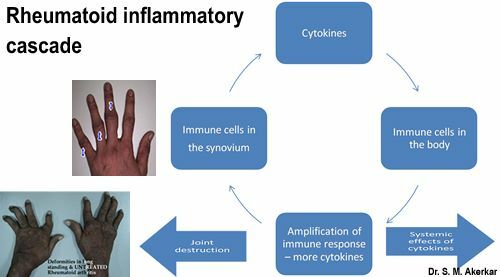 This way, we can block the effect of multiple cytokines with a single medication & reduce activation of immune cells thus keeping the Rheumatoid inflammation under check. Janus Kinase is an enzyme that works at the port of entry in the cell & helps the transduction of message (execution of the plot). We now have Tofacitinib (xeljanz), a Janus kinase blocker recently approved by FDA. As we saw, this is clearly a step ahead in our battle against the Rheumatoid Disease. We would be looking how well this technological advance really translates in practice in the further blogposts.